A sparkling talent makes her fiction debut with this infectious novel that combines the charming pluck of Eloise, the poignant psychological quirks of The Curious Incident of the Dog in the Night-Time and the page-turning spirit of Where'd You Go, Bernadette. Reclusive literary legend M. M. "Mimi" Banning has been holed up in her Bel Air mansion for years. But after falling prey to a Bernie Madoff-style ponzi scheme, she's flat broke. Now Mimi must write a new book for the first time in decades, and to ensure the timely delivery of her manuscript, her New York publisher sends an assistant to monitor her progress. The prickly Mimi reluctantly complies--with a few stipulations: No Ivy-Leaguers or English majors. Must drive, cook, tidy. Computer whiz. Good with kids. Quiet, discreet, sane. When Alice Whitley arrives at the Banning mansion, she's put to work right away--as a full-time companion to Frank, the writer's eccentric nine-year-old, a boy with the wit of Noel Coward, the wardrobe of a 1930s movie star, and very little in common with his fellow fourth-graders. As she slowly gets to know Frank, Alice becomes consumed with finding out who Frank's father is, how his gorgeous "piano teacher and itinerant male role model" Xander fits into the Banning family equation--and whether Mimi will ever finish that book. 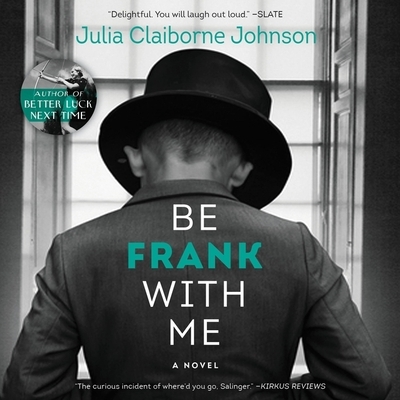 Full of heart and countless "only-in-Hollywood" moments, Be Frank with Me is a captivating and unconventional story of an unusual mother and son, and the intrepid young woman who finds herself irresistibly pulled into their unforgettable world.